John Frankenheimer’s masterful political thriller The Manchurian Candidate (1962) was released at the height of the Cuban Missile Crisis and reflects the mounting tensions between the United States and the Soviets during the Cold War. Based on Richard Condon’s 1959 novel of the same name, it features an intriguing narrative that involves brainwashing and assassination intertwined with ruthless political ambitions that eerily anticipated the killing of President John F. Kennedy. A squad of American soldiers is captured during the Korean War and taken to a secret place where they are brainwashed. They are released and return home as decorated war heroes. Among them is Raymond Shaw (Harvey) who is awarded the Congressional Medal of Honor by the President and is immediately thrust into the limelight by his ambitious mother (Lansbury) who uses him to get her senator husband (Gregory) re-elected. She controls her spouse and has him go on a Joseph McCarthy-esque Communist witch-hunt. She’s the manipulative power broker pulling the strings behind the scenes and Angela Lansbury plays it with icy cool. Meanwhile, Bennett Marco (Sinatra) is plagued by the same nightmare: he and his squad are guests at a ladies garden club attended by elderly women. As the camera pans around the room this banal, tranquil setting is gradually transformed into a room populated by Communist leaders from China, Russia and Korea. Frankenheimer cleverly blends the two realities as Marco tries to make sense of it. It is unsettling to see how docile and complacent they are and how conditioned they have become. It turns out that the other surviving members have the same nightmare as Marco and it ends the same way – with Shaw killing two members of the squad. Marco struggles to make sense of this nightmare, break free of the brainwashing and stop Shaw who has been programmed to kill a politician. Frank Sinatra is excellent as the tortured Marco who has to figure out this complicated assassination plot. His trademark swagger is muted as he plays a man fighting not only his conditioning but also trying to prove that a decorated war hero is a programmed assassin. Laurence Harvey delivers a brilliant performance as the seemingly perfect brainwashed assassin if it weren’t for his deep-seated hatred of his mother that gradually chips away at his programming. The actor does a fantastic job showing the bland, placid side as well as the deeply cynical one of his character. Frankenheimer does a fantastic job gradually ratcheting up the tension as Marco becomes the lone man against a complicated conspiracy. 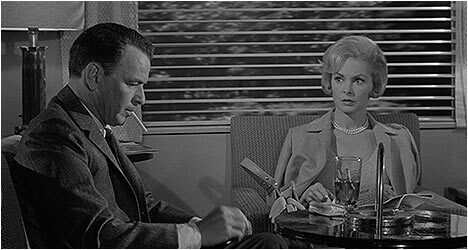 In some respects, The Manchurian Candidate anticipates the paranoid thrillers that became popular in the 1970s. Like Frankenheimer’s film, they were products of their time, snapshots of the socio-political climate. It is a first-rate political thriller that also comments on the Cold War and how opportunists used it and the fear of Communism to their advantage. The Criterion Collection edition features a new 4k resolution transfer with a fantastic amount of detail. The image looks darker than previous incarnations but this only adds to the textured look. The Manchurian Candidate looks fantastic. Ported over from an older edition is an audio commentary by director John Frankenheimer who talks about the nuts and bolts of making the film, like the lenses used, lighting and how he shot a given scene. He talks about staging the famous karate fight and provides some excellent observations throughout. He also gets caught up watching the film and this results in frequent lulls. There is a new interview with Angela Lansbury who talks about working with Frankenheimer. She says that Sinatra originally wanted Lucille Ball to play her role but Frankenheimer had worked with Lansbury before and fought for her. She also talks about working with Laurence Harvey and how his approach to acting differed from Sinatra’s. Also included is a new interview with filmmaker Errol Morris who talks about his appreciation of the film as well as some of its themes, Communism, the Cold War, and how Frankenheimer commented on America. Carried over from previous edition is a 1988 reunion of Frankenheimer, Sinatra and screenwriter George Axelrod. They talk about the film and reminisce about making it. Historian Susan Carruthers touches upon topics like brainwashing and Communism and puts them a historical context. She also talks about American soldiers that were captured during the Korean War.